Well then! A lot of monumental things happened in February. It was a stressful and exciting month to say the least. 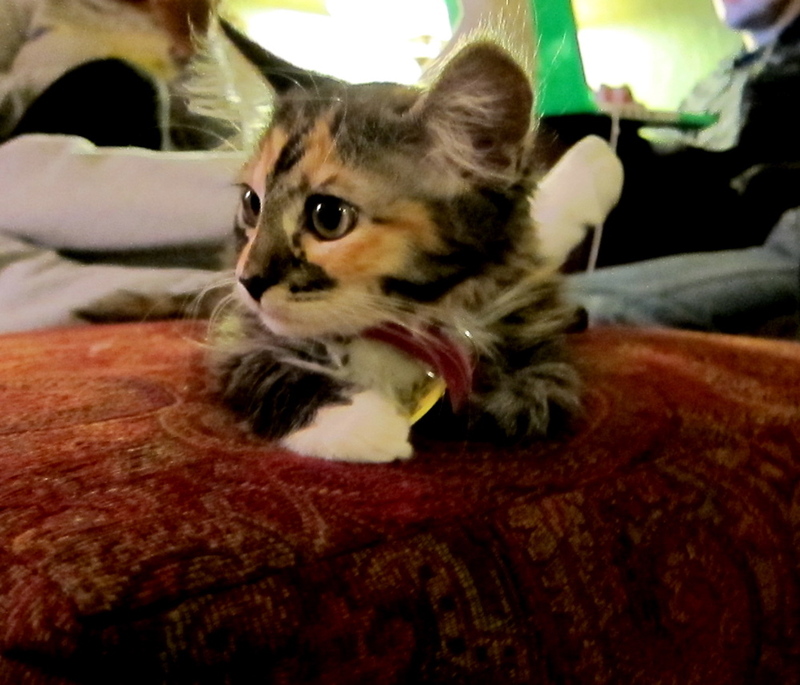 On February 8th, Philip made good on his promise to provide me with 1 kitten as a late Christmas present. Her name is Zoey–after Zoe Saldana–and she has drastically improved the condition of my life. She is sweet, silly, and makes me laugh. Isn’t she cute!? It’s amazing how having another creature depend on you can really make you feel much more like an adult. It’s a really nice feeling knowing that someone wants me home, and it evokes in me a feeling of belonging somewhere. Animals are great that way. They make home feel like home. Two days after adopting Zoey from the Oregon Humane Society, the dawn of February 10th came upon us: mine and Philip’s Three Year Anniversary. Epic, right? So epic that we actually got each other gifts (we don’t usually do this). From Philip I received the ever-appropriate spa certificate. Here’s a hint to any man who will ever buy a gift for a woman: Flowers. Jewelry. Spa certificate. I guarantee you that those are your best bets, (I spoke with my council and we concur). For Philip I got us each a ticket to see the Ducks play the Beavers in the Civil War game at the new Matthew Knight Arena. We both gave each other the gift of a desired experience, which was nice. 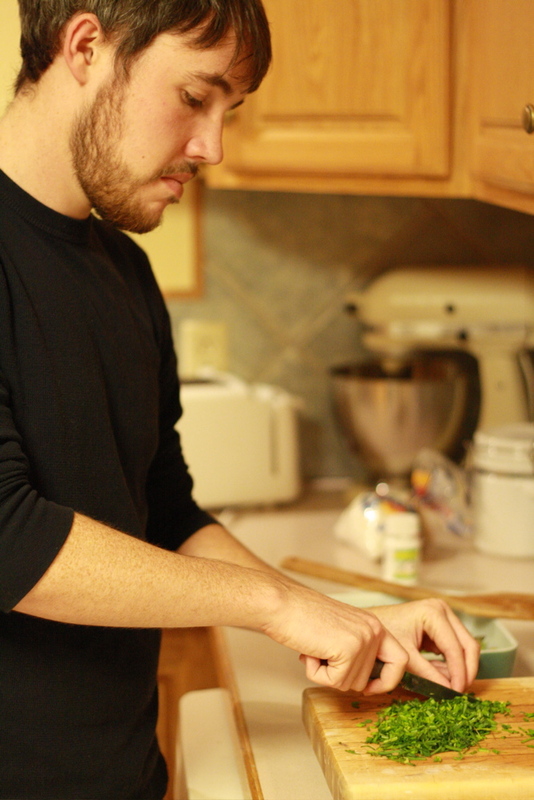 On the night of our three-year the festivities included a homemade–and might I add delicious–dinner that we made together, the movie Easy A (pretty funny), and an all-night-cuddle session with Zoey. Her name is Debbie. Well, her name was Debbie. May she rest in peace. 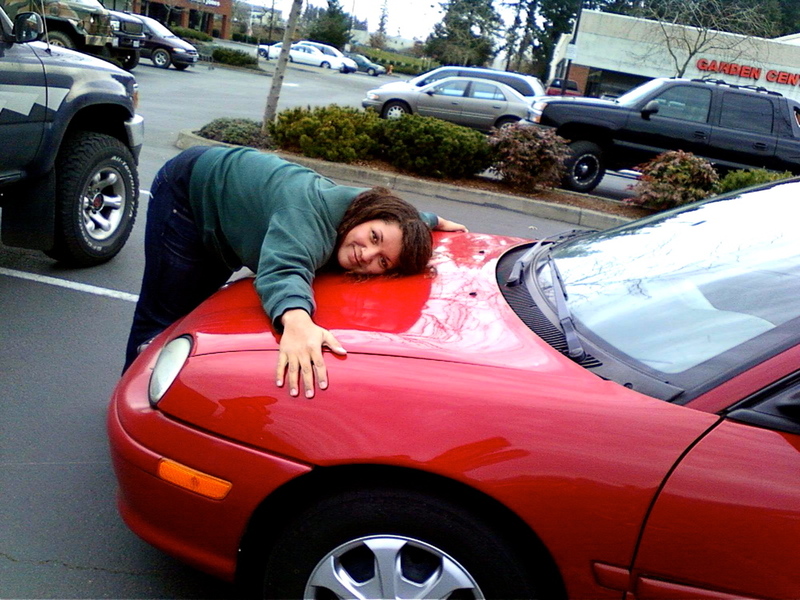 Her new owner now holds the power to re-name my tenacious little car however she sees fit. 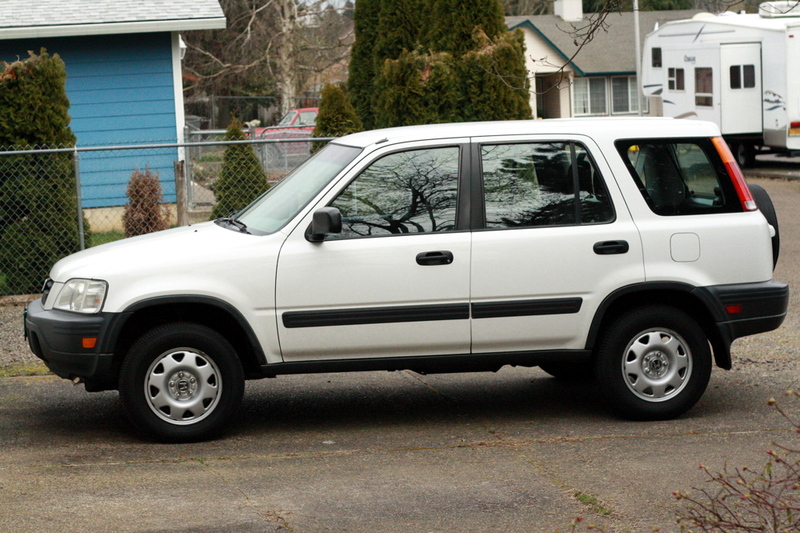 Despite my initial sadness over the fact, I have found immense joy in what I am about to announce: I am now the owner of a shiny, girly and white 2001 Honda CR-V. She doesn’t have a name yet, but it will come to me when the time is right. Oh wait, it just came to me. Harriet. 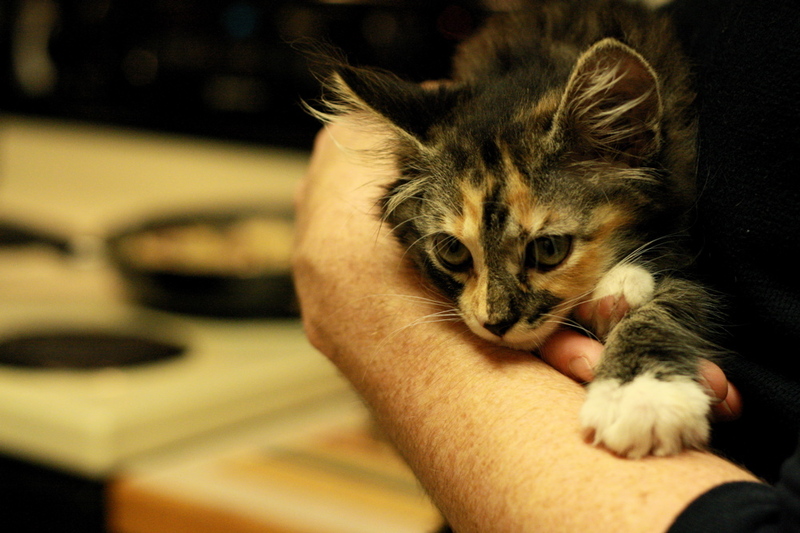 Her name is Harriet. Harriet the Honda. In addition to the aforementioned happenings, I have also been re-experiencing the challenges of living alone and eating healthy. Without the convenience of having my mother around to promptly stock the fridge, I haven’t been cooking nearly as often as usual. The last time I had an adult meal was on mine and Philip’s anniversary. 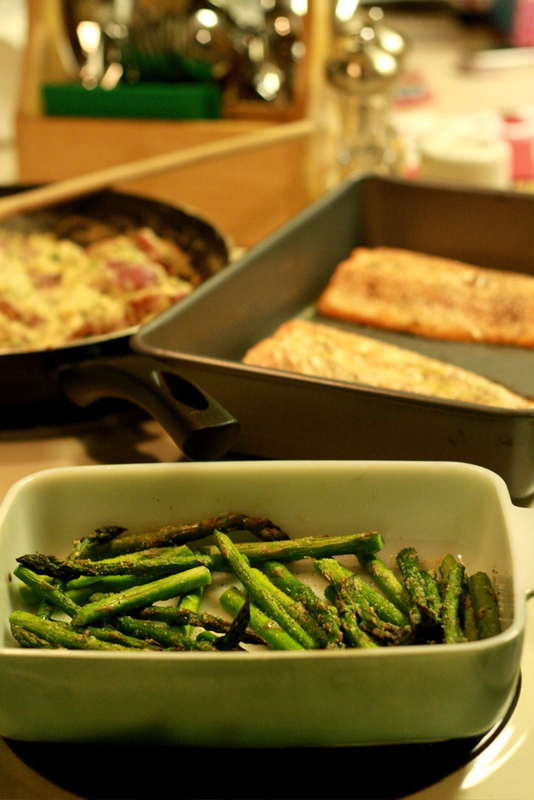 We made salmon, broiled asparagus, and hot red potato salad. I call it an “adult meal” because the potato side dish alone had several steps and ingredients that took a great amount of my attention, effort and focus. So this is the recipe that I will share with you today. Wash the potatoes and cut off the bad spots. You can peel them if you’d like but I like to leave the skins on. Chop the potatoes into quarters or a little smaller. Boil the potatoes for about 15 minutes or until just tender enough to bite. The skins should still be on the potatoes. Do not overcook because they will continue to cook in the skillet. Heat garlic, olive oil and onions in a large skillet over medium heat. When the oil is hot and the garlic starts to brown, add the potatoes to the pan. 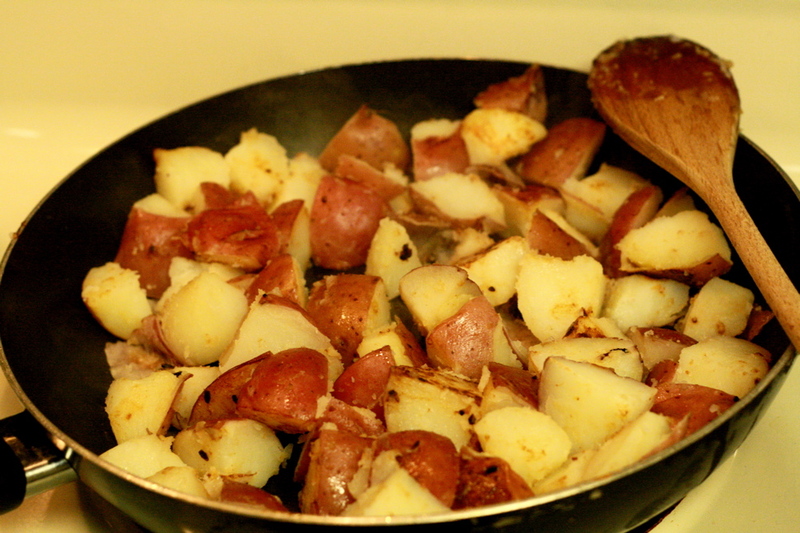 Continue to cook over medium until the sides of the potatoes are brown. Meanwhile, combine and stir together sour cream and ranch seasoning mix in a small bowl. 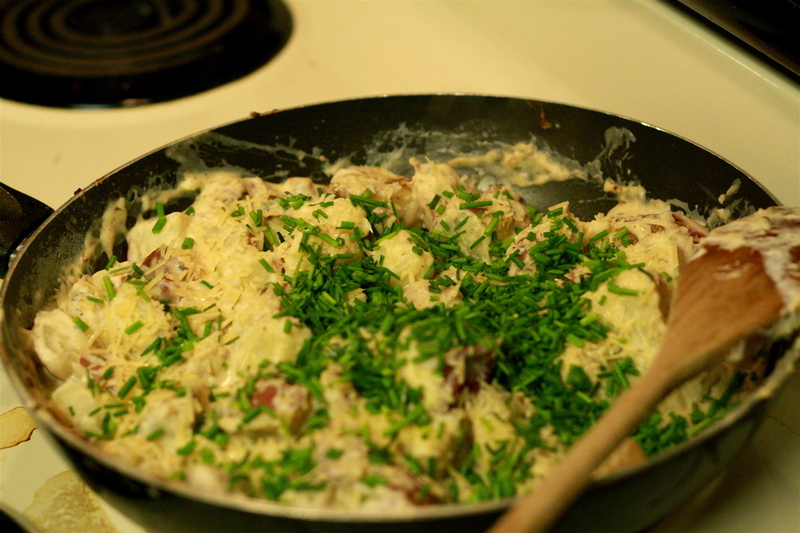 When mixture is thoroughly blended, pour it into the skillet with the potatoes and stir. Then stir in chives, salt and pepper, and parmesan. 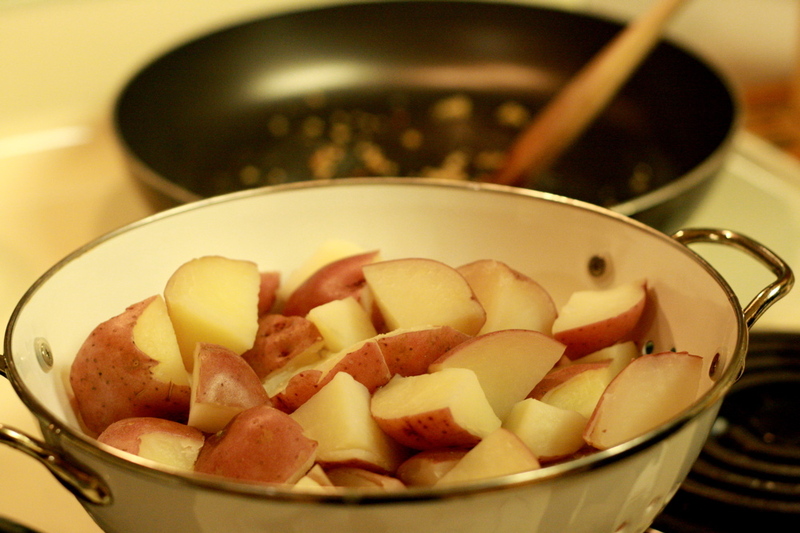 Let the potato salad simmer over low heat for 3-5 minutes. Serve with parmesan. Yield 3-4 servings.